The sardines diet not only can help with weight loss, but it also has advantages for general health. Detailed in the 2006 book, "The Sardine Diet," by certified dietitian/nutritionist Keri Glassman, the plan involves a high-fiber reduced-calorie diet that encourages eating sardines on a daily basis, though you can substitute other oily fish. Sardines are high in omega-3 fatty acids, known for their heart-health benefits. When following the sardines diet, you won't need to count calories or take supplements. The recommended foods and meals provide all the nutrition you need in the proper caloric amounts, according to Diets in Review. The diet provides lean protein, vitamins and minerals, while cutting saturated fats, trans fats and refined carbohydrates. The American Heart Association encourages eating at least two 3.5-ounce servings of fish per week for their omega-3 fatty acids. People with heart disease should eat even more. These nutrients decrease triglyceride levels, slow the accumulation of plaque in the arteries, lower blood pressure and reduce the risk of abnormal heartbeat, or arrhythmia. 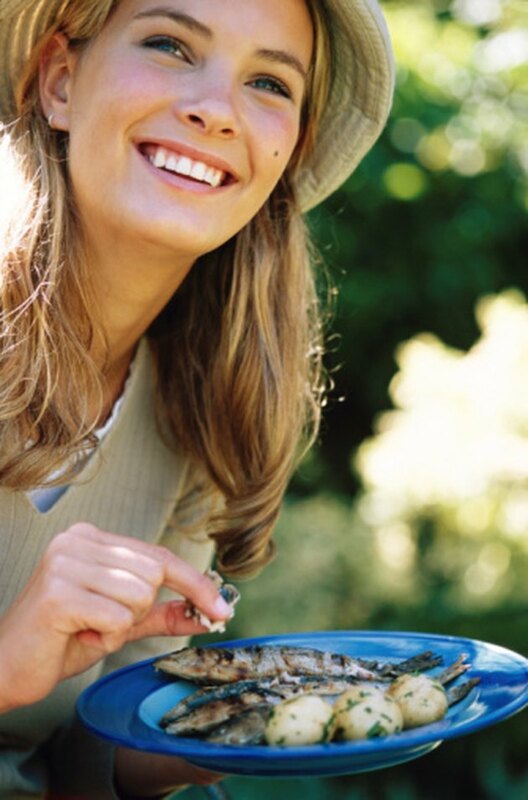 Sardines rank high on the omega-3 fatty acid scale, says nutritionist Anne Collins. Per 100 g of fish, or about a 3.5-ounce serving, mackerel is the best source with 2.2 g of omega-3 fats. Sardines and herring both provide 1.7 g per 3.5-ounce serving. Bluefin tuna, lake trout and Atlantic sturgeon supply 1.6 g, while salmon and anchovies each have 1.4 g per 3.5-ounce serving. One serving of sardines also provides lean protein and nearly three times the calcium in 1 cup of milk, as well as vitamin D and phosphorous essential for calcium absorption, according to the "The Sardine Diet." This diet involves eating three meals and two snacks per day. Diets in Review and the "The Sardine Diet" provide menu suggestions. Breakfast might include an oatmeal pancake with yogurt, smoked salmon or a cheese and broccoli omelet. For lunch or dinner, include a meal with oily fish such as a sardine tostada with avocado, sardine pasta primavera or an albacore tuna wrap, and for your other meal's main course, have roasted chicken, a turkey burger or pork tenderloin. Several species of sardines are available. "The Sardine Diet" recommends Nordic brisling sardines for the best flavor and texture. These fish are smaller than other sardine species, and come from areas such as Norway where the fishing industry is strictly regulated and the water is clean. The Sardine Diet: Why Sardines? How Much Salmon per Week Due to Mercury?